During the World Cup, I wrote about Mesut Ozil’s relationship with the German media, authorities and fans. My opinion at the time was a simple one, that Ozil was continually singled out for Germany for criticism because he is different. That whilst the likes of Thomas Muller, Joshua Kimmich and Manuel Neuer continually escape criticism for poor performances, Ozil is criticised even when he does not play badly. Mesut Ozil has won 92 caps for Germany. He is a World Cup winner. A 5 time German Footballer of the Year. He is clearly a class act. The abuse of Ozil is similar to what Raheem Sterling gets in England. It is not overtly racist, but when negative articles are written about you for buying a house for your mum, or going for breakfast the morning after a defeat, it creates a nasty little undertone. We saw similar last week with Dean Saunders attack on Alexandre Lacazette for TalkSPORT. The former Liverpool striker said Lacazette is more interested in fast cars and fur coats than playing football. That he needs to be more like Harry Kane and become more professional. Taking into account that it is Pierre-Emerick Aubameyang that likes the fast cars and fur coats, the attack by Saunders had racist undertones. It reinforced racial stereotypes that young, successful black men are flashy. That they are more interest in cars and coats than playing football. That they are simple not as professional as their white colleagues. Ozil retiring for Germany will be a good thing for Arsenal. We just need to make sure we get around him, show him the love and support he needs so that he performs for us. He has always been an emotional character. One that needs an arm around him, to be shown love to play well. He has never been one to be motivated by criticism. Ozil is an Arsenal player. Let’s get behind him. The second piece of Arsenal news over the weekend was Alex Iwobi. Firstly it broke that Lazio were interested in signing him in a £20million deal, then it was that he had agreed a new contract until 2022. When the first pice of news broke, many people were happy. Iwobi is simply not rated by many fans. He has not really progressed from the timid teenager who looked like a deer in headlights when he first broke through. Personally, I did not want him sold, I want to see him for another year under Unai Emery. But £20million is a lot to turn down. If a figure like that came in, I would accept. A chat about racism again. Some fans came out and claimed that other Arsenal wanting Iwobi sold was racist. Comparing it to the Jack Wilshere situation, even to the Ozil situation. This is just rubbish. People wanted Iwobi to be sold because they felt he was not good enough. A perfectly valid opinion. It has nothing to do with his skin colour, or being born in Nigeria. To a lot of the older generation, Rocky Rocastle was a hero. To my generation it was Thierry Henry. It reminds me of when that journalist claims that Highbury was a “no-go zone” in the early 2000’s. It is lazy to always attack any criticism as racism. If Iwobi does stay, I hope he kicks on. There is a good player in there, I am sure of it. He just needs the confidence in himself to realise that and break out. He is 22 now, so a loan deal is not suitable. With the likes of Ainsley Maitland-Niles and Reiss Nelson pushing to break through, Iwobi needs to up his game if he wants to stay at Arsenal long term. This entry was posted in Arsenal and tagged Alex Iwobi, Arsenal, Mesut Özil, She Wore, She Wore A Yellow Ribbon on July 23, 2018 by keenosafc. Everything seems to have gone quiet with regard to his contract. I feel his time at Arsenal could be up. The fact that he was heavily linked with the likes Wolves and West Ham over the weekend probably shows his level. Delightful performance by Iwobi for Nigeria. The pass and then the finish, he was heavily involved as the Eagles went down 2-1 to England. What was most impressive for me was they way he went deep to get the ball, and did not shy away from attempting to dictate the play. I am not saying he will become world class, but it is easy to forget he is just 22. If he is given a staring role for Nigeria this summer, he will come back to Arsenal a more confident player. He is more than good enough to back up Mesut Ozil, Henrik Mkhitaryan and one more. The gossip season is full swing. In the last few days we have been linked with Ousmane Dembele, Abdoulaye Doucouré, Steven N’Zonzi, Jasper Cillessen, Benjamin Pavard, Yacine Adli & Gelson Martins. I could probably find more names if I could be bothered to look. As we learn with Luis Suarez, Gonzalo Higuain and more recently with Sokratis (it all seems to have gone quiet) it is not a done deal until you see the player with the shirt. Do not believe the attention seekers on twitter, or the journalists who a fabricating stories for clicks. Luckily it will not be a long summer, as the window shuts on the eve of the Premier League season. I took some hammering for calling him a rent-a-quote gobshite in yesterday’s blog. I stick with what I said and challenge anyone to disagree with my criticism of his comments. Petit criticised Arsenal for “only signing youngsters in the last 15 years”. This is plainly wrong and highlights what he was saying was without knowledge. You can complain about the quality of some of these, but not their age or experience. We have certainly moved away from the mid 00’s policy of buying young, and the above makes the obvious. Petit was speaking without knowledge. Like when he mentioned the £60m budget. I guess what sums up the situation is one critic of my blog said “people ask for Petit’s opinion…and not yours”. You are right outlets do ask for Petit’s opinion, because they know it will give them a quote and headline for a story. He is a rent-a-quote. Unwilling to pay the £64.95 for the official kit? Following the trend of wearing old school retro kits from the 80s and 90s? 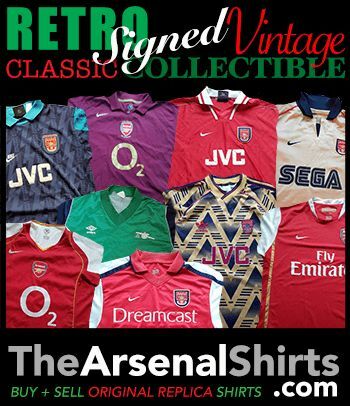 We have followed the success of the She Wore Shop (exclusive Arsenal merchandise) site and The Arsenal Shirts (real old school Arsenal shirts, signed and match worn) with a new venture, Retro Kits. Will be loading up more national shirts every day and giving away free shirts too. This entry was posted in Arsenal and tagged Alex Iwobi, Arsenal, Emmanuel Petit, Jack Wilshere, retro kits, She Wore, She Wore A Yellow Ribbon on June 4, 2018 by keenosafc.